I usually prefer not to spend too much on accommodation when on holiday. I'm quite comfortable as long as the hotel is decent - which means clean and with air-conditioning (especially if I'm in a tropical climate). This time however, it was a treat to be at the Shangri-La. 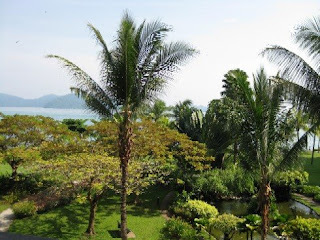 The service was impeccable, and the resort surroundings lush with greenery. The rooms, as expected, were very comfortable, with all the touches of a luxury hotel. While I was initially put off by how big the place was (I was imagining small and private for some reason! weirdo), I quickly appreciated how, despite the number of rooms, there were always many quiet spaces all around the resort. We could comfortably lounge around, with no one to disturb us. This place was obviously designed for quiet retreat for those who want it, while also availing other options for holidaymakers who prefer a more action-packed holiday. looks really good...Thanks for the recommendation! I immediately showed tehpeng the pics..hehe! love the dress on you too!